This invitation marks the beginning of each day for the Orthodox Church. It comes from the office of Vespers, and it expresses the attitude that is at the heart of Orthodoxy. The Worship of God - the Father, Son, and Holy Spirit, - is fundamental to the life and spirit of the Orthodox Church. Since Worship is so important to Orthodoxy, the best introduction to the Orthodox Church is the celebration of the Divine Liturgy for it is in Worship that the distinctive flavor, rich traditions, and living faith of Orthodoxy are truly experienced. Worship is an experience that involves the entire Church. When each of us comes together for Worship, we do so as members of a Church that transcends the boundaries of society, of time and of space. Although we gather at a particular moment and at a particular place, our actions reach beyond the parish, into the very Kingdom of God. We worship in the company of both the living and the departed faithful. There are two dimensions to Orthodox Worship that are reflected throughout the many Services of the Church. First, Worship is a manifestation of God’s presence and action in the midst of His people. It is God who gathers His scattered people together, and it is He who reveals Himself as we enter into His presence. The Worship of the Orthodox Church very vividly expresses the truth that God dwells among His people and that we are created to share in His life. 1. 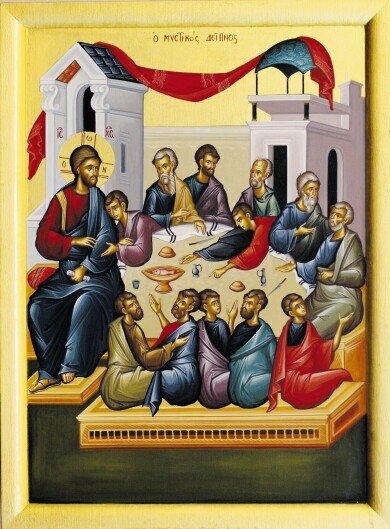 The Eucharist, which is the most important worship experience of Orthodoxy. Eucharist means thanksgiving and is known in the Orthodox Church as the Divine Liturgy. 2. The Sacraments, which affirm God’s presence and action in the important events of our Christian lives. All the major Sacraments are closely related to the Eucharist. These are: Baptism, Chrismation, Confession, Marriage, Holy Orders, and Anointing of the sick. 3. Special Services and Blessings, which also affirm God’s presence and action in all the events, needs and tasks of our life. 4. The Daily Offices, which are the services of public prayer which occur throughout the day. The most important are Matins, which is the morning prayer of the Church, and Vespers, which is the evening prayer of the Church. Since Worship in Orthodoxy is an expression of the entire Church the active participation and involvement of the congregation is required. There are no “private” or “said” Services in the Orthodox Church and none may take place without a congregation. This strong sense of community is expressed in the prayers and exhortations which are in the plural tense. The congregation is expected to participate actively in the Services in ways such as: singing the hymns; concluding the prayers with “Amen”; responding to the petitions; making the sign of the Cross; bowing; and, especially, by receiving Holy Communion at the Divine Liturgy. Standing is the preferred posture of prayer in the Orthodox Church; although pews are available for parishioners to sit during various parts of the service and for those for whom standing is difficult. The congregation traditionally kneels only at particularly solemn moments, such as the Invocation of the Holy Spirit during the Divine Liturgy. The Holy Eucharist is the oldest experience of Christian Worship as well as the most distinctive. Eucharist comes from the Greek word that means thanksgiving. In a particular sense, the word describes the most important form of the Church’s attitude toward all of life. The origin of the Eucharist is traced to the Last Supper at which Christ instructed His disciples to offer bread and wine in His memory. The Eucharist is the most distinctive event of Orthodox worship because in it the Church gathers to remember and celebrate the Life, Death, and Resurrection of Christ and, thereby, to participate in the mystery of Salvation. In the Orthodox Church, the Eucharist is also known as the Divine Liturgy. The word liturgy means people’s work; this description serves to emphasize the corporate character of the Eucharist. When an Orthodox Christian attends the Divine Liturgy, they come as a member of the Community of Faith who participates in the very purpose of the Church, which is the worship of the Holy Trinity. Therefore, the Eucharist is truly the center of the life of the Church and the principal means of spiritual development, both for the individual Christian and the Church as a whole. Not only does the Eucharist embody and express the Christian faith in a unique way, but it also enhances and deepens our faith in the Trinity. This sacrament-mystery is the experience toward which all the other activities of the Church are directed and from which they receive their direction. 1. The Liturgy of Saint John Chrysostom, which is the most frequently celebrated. 2. The Liturgy of Saint Basil the Great, which is celebrated only ten times a year. 3. The Liturgy of Saint James which is celebrated on October 23, the feastday of the Saint. In addition to these Liturgies, there is also the Liturgy of the Pre-Sanctified Gifts. This is not truly a eucharistic liturgy but rather an evening Vesper Service followed by the distribution of Holy Communion reserved from the previous Sunday. This liturgy is celebrated only on weekday mornings or evenings during Lent, and on Monday, Tuesday, and Wednesday of Holy Week, when the full Eucharist is not permitted because of its Resurrection spirit. The Eucharist expresses the deep joy which is so central to the Gospel. However, the Divine Liturgy is not celebrated by the priest privately, without a congregation. The Eucharist is usually celebrated in the morning but, with the Bishop's blessing, may be offered in the evening. All the other Sacraments of the Church lead toward and flow from the Eucharist, which is at the center of the life of the Church. The Sacrament of Baptism incorporates us into the Church, the Body of Christ, and is our introduction to the life of the Holy Trinity. Water is a natural symbol of cleansing and newness of life. Through the three-fold immersion in the waters of Baptism in the Name of the Holy Trinity, one dies to the old ways of sin and is born to a new life in Christ. Baptism is one’s public identification with Christ’s Death and victorious Resurrection. Following the custom of the early Church, Orthodoxy encourages the baptism of infants. The Church believes that the Sacrament is bearing witness to the action of God who chooses a child to be an important member of His people. From the day of their baptism, children are expected to mature in the life of the Spirit, through their family and the Church. The Baptism of adults is practiced when there was no previous baptism in the name of the Holy Trinity. You may schedule the celebration of the Sacrament of Baptism by calling the Saint Barbara Church Office at: 203-795-1347. In the Sacrament of Chrismation, the priest anoints the various parts of the body of the newly-baptized with Holy Oil saying: “The seal of the gifts of the Holy Spirit.” The Holy Oil, which is blessed by the bishop, is a sign of consecration and strength. The Sacrament emphasizes the truths that not only is each person a valuable member of the Church, but also each one is blessed by the Spirit with certain gifts and talents. The anointing also reminds us that our bodies are valuable and are involved in the process of salvation. The Sacraments of initiation always are concluded with the distribution of Holy Communion to the newly-baptized. This practice reveals that Orthodoxy views children from their infancy as important members of the Church. There is never time when the young are not part of God’s people. The process of joining the church varies according to each person’s situation and circumstances. Baptized Christians are generally received into the Orthodox Church through the Sacrament of Chrismation. In general, the Orthodox Church does not re-baptize a Christian who has received baptism in a mainline Protestant or the Roman Catholic Church. The criterion is that the Baptism was done in the name of the Holy Trinity. For those interested in being recieved into the Orthodox Church, an initial appointment may be scheduled with Father Peter during which a method of preparation for the Chrismation is discussed. Confession is the Sacrament through which our sins are forgiven, and our relationship to God and to others is restored and strengthened. Through the Sacrament, Christ our Lord continues to heal those broken in spirit and restore the Father’s love those who are lost. According to Orthodox teaching, the penitent confess to God and is forgiven by God. The priest is the sacramental witness who represents both Christ and His people. The priest is viewed not as a judge, but as a physician and guide. It is an ancient Orthodox practice for every Christian to have a spiritual father to whom one turns for spiritual advice and counsel. Confession can take place on any number of occasions. The frequency is left to the discretion of the individual. In the event of serious sin, however, confession is a necessary preparation for Holy Communion. Participation in the Sacrament of Confession can be arranged by calling the Saint Barbara Church Office at: 203-795-1347. As with Chrismation, oil is also used in this Sacrament as a sign of God’s presence, strength, and forgiveness. After the reading of seven Epistle lessons, seven Gospel lessons and the offering of seven prayers, which are all devoted to healing, the priest anoints the body of the faithful with the Holy Oil. Orthodoxy does not view this Sacrament as available only to those who are near death. It is offered to all who are sick in body, mind, or spirit. The Church celebrates the Sacrament for all its members during Holy Week on Holy Wednesday and other times throughout the year by request. The Orthodox Church remembers the departed in the prayers of every Divine Liturgy. Besides this, there is a Memorial Service in which the Church also remembers the dead. According to tradition, the Memorial Service is offered on the third, ninth, and fortieth day after a death, as well as on the yearly anniversary of the death. In addition to these times, the Memorial Service is always offered for all the faithful departed on four “Saturdays of the souls.” These are: the two Saturdays preceding Great Lent; the first Saturday of Great Lent; and, the Saturday before Pentecost. To schedule a Memorial Service please call the Saint Barbara Church Office at: 203-795-1347. Theophany (Epiphany), one of the oldest and most important Feast days of the Orthodox Church, commemorates the manifestation of the Holy Trinity which took place at the Baptism of Christ in the Jordan River. Recognizing rich meaning in this event, Orthodoxy believes that when Christ was baptized, it not only marked the beginning of its public ministry and revealed the Trinity, but also signified that the entire creation is destined to share in the glory of redemption in Christ. The Vespers service in the Church always begins with the reading of the evening psalm: “...the sun knows it’s time for setting, You make darkness and it is night….” (Psalm 103: 19-20) This psalm, which glorifies God’s creation of the world, is our very first act of worship, for humanity first of all meets God as Creator. “O Lord, how manifold are Thy works! In wisdom have You made them all. The earth is full of Your creatures...” (Psalm 104:24). Following the psalm, the Great Litany, the opening petition of all liturgical services of the Church is intoned, during which we pray to the Lord for everyone and everything. Following this litany, Psalm 141 is chanted during which the evening incense is offered: “Let my prayer arise as incense before You, the lifting up of my hands, as an evening sacrifice.” (Psalm 140:2). At this point special hymns are sung for the particular day. If it be a Church or Saint’s feastday: songs in honor of the celebration are sung. On Saturday evenings, the eve of the Lord’s Day, these hymns always praise Christ’s resurrection from the dead. “Lord, now let your servant depart in peace, according to your word; for my eyes have seen your salvation which you have prepared in the presence of all peoples, a light for revelation to the Gentiles, and for the glory of your people Israel.” (Luke 1:29-32). Vespers service are celebrated throughout the year at the community of Saint Barbara and at other Orthodox Churches throughout the State of Connecicut on the eve of their parish’s feast day. The morning service of the Church is called Matins or Orthros. It opens with the reading of six morning psalms and the intoning of the Great Litany. After this, verses of Psalm 118 are chanted: “God is the Lord and has revealed himself unto us. Blessed is He who comes in the name of the Lord.” The Troparion is then chanted; on major feast days, special praises and psalms are sung, which on Sunday proclaim Christ’s resurrection from the dead. On major feastdays and on Sundays, the Gospel is also read. After the Gospel reading there is a long intercessory prayer followed by a set of hymns and readings called the Canon. These songs are based on the Old Testamental canticles and conclude with hymns honoring the Theotokos. These hymns are followed by the chanting of a Doxastikon and the Great Doxology and on Sundays and Feastdays the celebration of the Holy Eucharist. In addition to the liturgical services of Vespers and Matins, there are also the services of the Hours, Compline, and the Midnight Service. These services are mostly chanted in monasteries but are celebrated in parish churches during Great Lent and Holy Week, and on special feast days. The services of Hours are comprised of four parts: the First, Third, Sixth and Ninth. These “hours” conform generally to the hours of six and nine in the morning, noon, and three in the afternoon. The services consist mostly of psalms which are generally related to the events in the passion of Christ which took place at that particular hour of the day. The Third Hour also refers to the coming of the Holy Spirit to the disciples on Pentecost. The service of the Royal Hours are celebrated at the Saint Barbara parish on the eve of the feasts of the Nativity, Theophany and on Great and Holy Friday. The Compline service at the Saint Barbara parish is celebrated on Monday evenings during Great and Holy Lent. In conjunction with the celebration of Theophany (Epiphany) on January 6, and the service of the Great Blessing of the Water, it is traditional for the Priest in Orthodox parishes to travel to the homes and businesses of parishioners and bring the blessing of the Jordan into our daily lives. We do this each year by having the priest bless our homes and businesses with the Holy Water from the service of Theophany, offering prayers for our health, our family and the Lord’s abundant blessings in the coming year. Each year, the around the feast of Theophany, the Church office publishes a “House Blessing Schedule” outlining the dates and areas that Father Peter will be visiting. To schedule a house or business blessing simply call the Church office and schedule a visit. The service takes only a few minutes, but the blessings are there all year! When he visits, please have ready: 1) a list of the names of your family members, 2) a small bowl of water and 3) an icon. He will begin the service in the dining room or in the area of your home where you keep your icons, then he will ask you to guide him around the house.